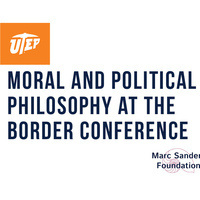 The Moral and Political Philosophy at the Border Conference aims to highlight philosophical research in moral, social, and political philosophy . We welcome work in any area of moral and political philosophy since one aim of this conference is to enrich the dialogue at the border about issues in these areas. We especially encourage work relevant to philosophical issues about the border such as immigration and human rights.